The grounds will be available to entrants for unloading and preparation from no earlier than 3PM on Wednesday the 21st of November and close at 5PM. The circuit will be available for private practice and testing on Thursday the 22nd November at a cost of $105.00. Gates will open at 6AM. 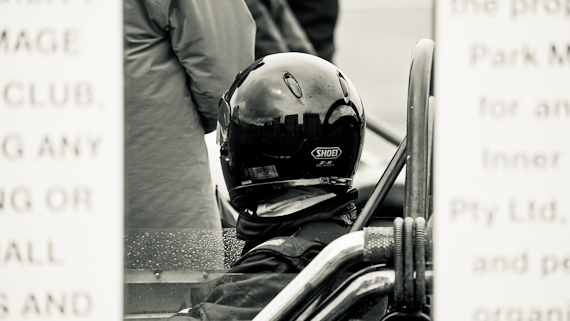 Entries for the 2012 Tasman Revival are now open and we can’t wait to head out to the track for some historic racing with you all! We will be using Motor Event Entry as the primary mode of entry for the 2012 Tasman Revival. It is an online entry system developed by a regular competitor at historic events in order to solve a lot of the difficulty and time-consuming repetition involved in entering historic racing events in the past. If you have an existing Motor Event Entry account, you are just one simple step away from entering the 2012 Tasman Revival. Click this link to head directly to the 2012 Tasman Revival entry page on Motor Event Entry, and we’ll see you at Sydney Motor Sport Park! Motor Event Entry is secure, password protected, free and easy to use, and has been successfully used by the HSRCA for its historic racing events since the 2011 Autumn historics, along with several of our brother and sister clubs around the country. Its key benefit is that you need only enter your personal details, car information and team ONCE, and then these details are made available to you each time you enter a new event. You can update your information easily and quickly whenever necessary, and please do, as it helps us greatly in staying in touch and putting together future events. Motor Event Entry is NOT available for our international entrants for this event. Please see the entry information documentation for International entrants below. Modern browsers such as Internet Explorer 8 and 9, Chrome, Firefox and Safari, are supported. Old browsers such as Internet Explorer 6 and 7 are not. Supplementary regulations (read them), an invitation to the 2012 Tasman Revival and entry forms are available below. If you would like to enter using our previous paper or email based systems, read on for the required documentation. Entry lists for the 2012 Tasman Revival will be made available here in the weeks leading up to the event. Documentation for the 2012 Tasman Revival Meeting will be provided for download on this page. Click on the name of the document to open it or save a copy to your computer. Entrant / driver’s name and contact details (Email / phone / postal address). Details of competing car and desired shipment departure location. Event entry for all private practice, qualifying sessions and racing. Return container sea freight shipping costs ex UK, USA, NZ or Japan. Wharfage and related charges at Sydney port. Return car transportation between Sydney port and Sydney Motor Sport Park. Assisted unloading and re-loading of cars at circuit. Pit lane garage or marquee cover at circuit. Access to qualified personnel for race car preparation and assistance (at entrant’s cost). Personal reception of invited guests at airport and transportation to hotel. One double room accommodation for 3 nights at the 4½ star Chifley Hotel Eastern Creek. Wharfage fees and related charges at the departure port are at the entrant’s cost. Insurance arrangements for cars and equipment are the responsibility of entrants. The HSRCA will issue invitations to those cars that it believes most appropriately fit the theme of the meeting and maintains the right to make that decision. Departure points for container shipments will be geared to car locations but are expected to include the UK, USA (east and west coasts), Japan and NZ (Auckland and Christchurch). Entrants will need to arrange transportation of cars to the loading point and assistance with the loading of cars and equipment into the containers. UK and USA – mid to late September. HSRCA’s shipping agent is Gibson Freight, a world leader in race car shipping logistics with experience in the worldwide movements of Formula One, A1GP, Moto GP, and V8 Supercars. The containers will be securely stored at Gibson’s Sydney depot pending transportation to the Sydney Motor Sport Park circuit.